All creatures are known to be careful around the presence of humans and they maintain what they consider to be a ‘safe’ distance as one approaches. And if by chance, one manages to breach this ‘circle of confidence’ they would either take off or scurry away in an attempt to maintain this ‘safe’ distance. Rahul Sachdev has a very nice blog-post on this (http://www.rahulsachdev.net/dont-cross-the-circle-too-soon/). And if you have a reading habit, you should pick up the book by Lawrence Anthony entitled The Elephant Whisperer : My life with the Herd in the African Wild, where he talks about how, over a period of time, the matriarch of a herd of wild elephants built up enough trust in him to let him inside the ‘circle’. 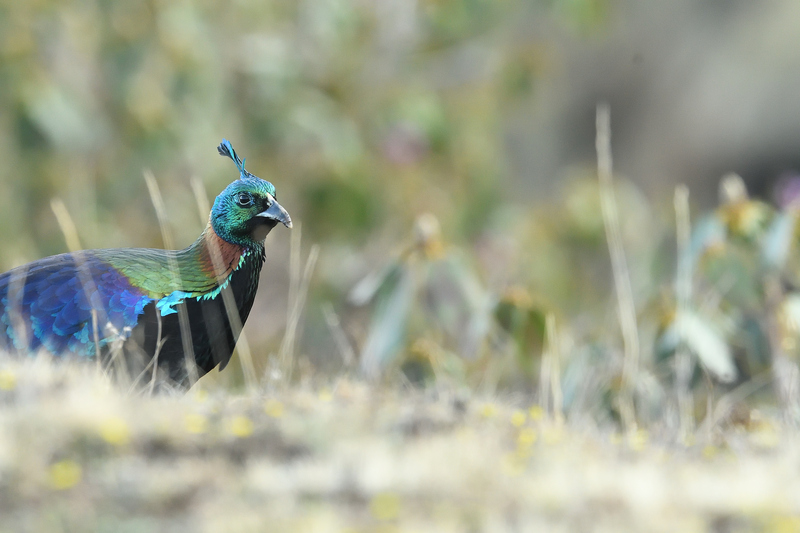 Given what little I knew about the Monal from an earlier trip, when we set off down the slopes of Tungnath after spotting a couple of them, I never really expected to encounter one of those ‘I-just-have-too-much-glass’ situations. I fully expected that the two male Monal we had spotted would continue to keep edging away from us as they keep foraging. We had taken a diagonal approach towards them and I had kept a few bushes between the bird and myself as I crawled forward gingerly. There was also a deep ridge running diagonally a bit ahead and when the bird went down that ridge it created a small window of opportunity to reduce the distance considerably. But little did I expect to be nearly at hand-shaking distance with this lovely bird. Infact I was caught so off-guard that I nearly forgot that I had a couple of cameras in my hand. We looked each other in the eye and thankfully, since I had my big camera still pointed in his direction, I slowly and gently lowered my eyes to the viewfinder. Any sudden movement I made would have spooked the bird and it would have surely taken off. There was no way I could fit this big a bird in my frame but I quite liked the feel of the completely out-of-focus foreground and background, the blades of grass in the frame (some consider them distracting but for me they were natural elements of the habitat, though they were causing me enough issues with focussing) and the Monal looking at me attentively. Clearly, he may not have been too comfortable with what he saw (I can’t blame him, ha ha). He decided to put some distance between ourselves, but not before I managed some nice shots. Once he got the distance between us to what he considered ‘safe’, he continued foraging on the slopes giving us a good 15 minutes of time to observe him.